Historical marker #1513 in Jessamine County commemorates the site of the Camp Nelson Covered Bridge, which was razed in 1933. Kentucky artist Paul Sawyier painted several scenes near Camp Nelson while he was living on his houseboat on the Kentucky River. One painting, "Bridge Over Kentucky River at Camp Nelson with Distillery," includes the Camp Nelson Covered Bridge. The distillery was established by E.J. Curley in 1875, and Old Fitzgerald whiskey and Canada Dry ginger ale were produced at the Curley distillery. Paul Sawyier's style is typically categorized as American Impressionism even though he actually painted in a range of styles over the course of his career. American Impressionism, like French Impressionism, adopted new techniques in painting including the use of short, broken brushstrokes, pure unblended and sometimes vibrant colors, and an emphasis on the effects of light. Critics of Impressionism described the paintings as unfinished sketches. The lack of detail was said to give only a hint or "impression" of the subject matter; hence the origin of the name Impressionism. William Merritt Chase, with whom Sawyier studied under in New York, was the first major American painter to create Impressionist paintings in the United States. Most Impressionists, like Claude Monet, painted strictly outdoors on location and in natural light. Sawyier did initiate many of his works while in nature; however, he would often finish them in his studio. Personal documents and friends' reminiscences reveal that Sawyier often painted from photographs. His early works were predominantly in watercolor, but later works were painted in gouache or oils. 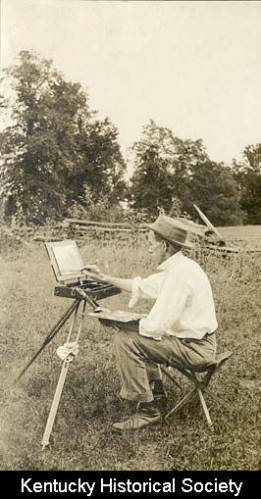 Paul Sawyier painting in a field: Photograph of Paul Sawyier painting in a field. Courtesy of the Kentucky Hiatorical Society. 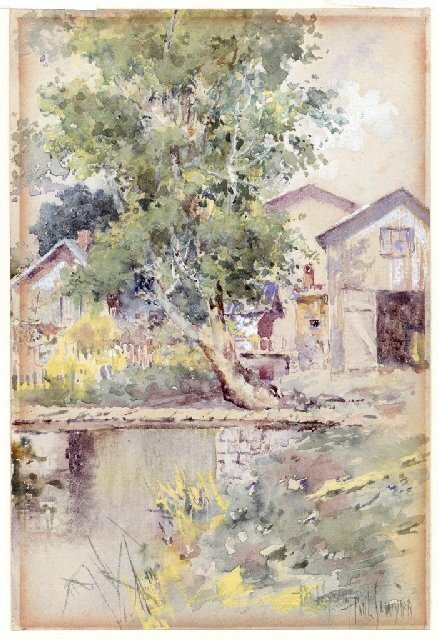 Footbridge: Painting of a footbridge in a small town by Paul Sawyier. Photo courtesy of the Kentucky Historical Society. 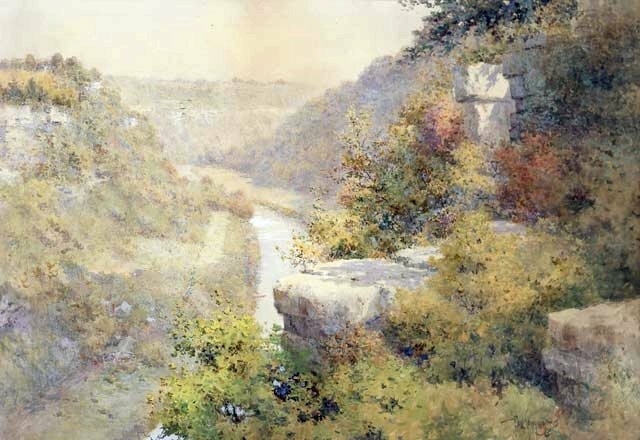 Lover's Leap: Painting of Lover's Leap- a rock looking out over the Kentucky River- by Paul Sawyier. Photo courtesy of the Kentucky Historical Society. 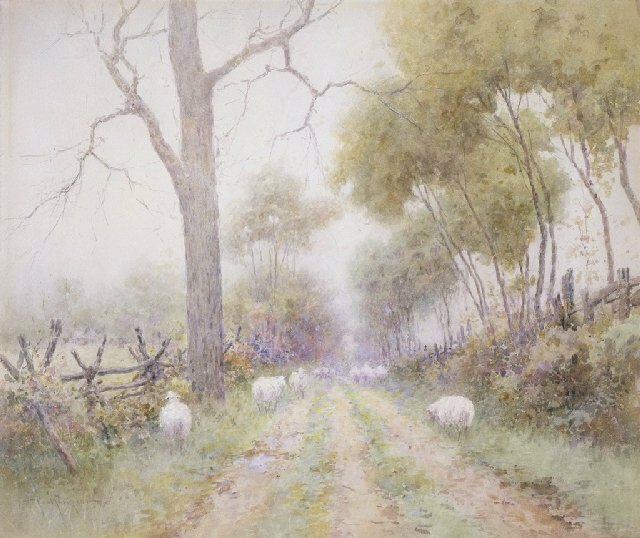 Sheep in Lane: Painting of Sheep in a Lane by Paul Sawyier. 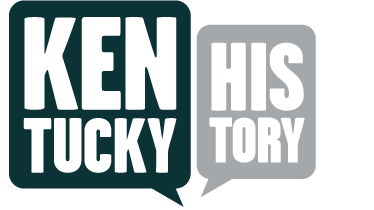 Photo courtesy of the Kentucky Historical Society. Amy Roe, “Camp Nelson Covered Bridge,” ExploreKYHistory, accessed April 22, 2019, https://explorekyhistory.ky.gov/items/show/245.